Tracy Lamar McGrady Jr. (born May 24, 1979) is an American former professional basketball player who is best known for his career in the National Basketball Association (NBA), where he played as both a shooting guard and small forward. McGrady was a seven-time NBA All-Star, seven-time All-NBA selection, two-time NBA scoring champion, and one-time winner of the NBA Most Improved Player Award. He was inducted into the Naismith Memorial Basketball Hall of Fame as part of the Class of 2017. The shooting guard (SG), also known as the two or off guard, is one of the five traditional positions in a regulation basketball game. A shooting guard's main objective is to score points for his team and steal the ball on defense. Some teams ask their shooting guards to bring up the ball as well; these players are known colloquially as combo guards. A player who can switch between playing shooting guard and small forward is known as a swingman. In the NBA, shooting guards usually range from 6' 3" to 6' 7" and 5' 9" to 6' 0" in the WNBA. The NBA high school draftees are players who have been drafted to the National Basketball Association (NBA) straight out of high school without playing basketball at the collegiate level. The process of jumping directly from high school to the professional level is also known as going prep-to-pro. Since 2006, the practice of drafting high school players has been prohibited by the new collective bargaining agreement, which requires that players who entered the draft be 19 years of age and at least one year removed from high school. Contrary to popular belief, the player does not have to play at least a year in college basketball: the player can choose to instead play in another professional league like Brandon Jennings or Emmanuel Mudiay in Italy and China respectively; simply take the year off, as Mitchell Robinson and Darius Bazley did; or even hold themselves back a year in high school before declaring for the draft, like with Satnam Singh Bhamara or Thon Maker. The 1997 NBA draft took place on June 25, 1997, in Charlotte, North Carolina. Although the Boston Celtics had the second-worst record in the 1996–97 season and the best odds of winning the lottery with two picks, the Spurs, usually a model of winning and consistency, lost David Robinson and Sean Elliott to injury early in the season, finished with the third-worst record, and subsequently won the lottery. Leading up to the draft, there was no doubt that Tim Duncan would be selected at No. 1 by the Spurs, and the rest of the draft was regarded with some skepticism. The Celtics had the third and sixth picks, selecting Chauncey Billups and Ron Mercer, both of whom were traded in the next two years. 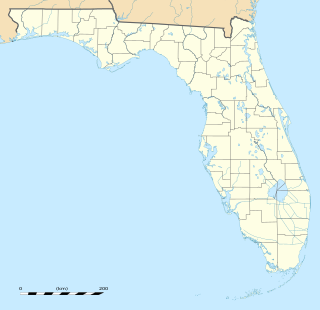 Bartow is the county seat of Polk County, Florida, United States. Founded in 1851 as Fort Blount, the city was renamed in honor of Francis S. Bartow, the first brigade commander of the Confederate Army to die in combat during the American Civil War. According to the U.S. Census Bureau 2000 Census, the city had a population of 15,340 and an estimated population of 16,959 in 2009. It is part of the Lakeland−Winter Haven Metropolitan Statistical Area, which had an estimated population of 584,383 in 2009. As of 2018, the mayor of Bartow is Leo Longworth. Auburndale High School is a four-year public high school located in Auburndale, Florida, and a part of Polk County Public Schools. The school serves about 1,600 students from ninth through twelfth grades. The minority rate is 37% and the free/reduced lunch rate is 49%. Darrell Walker is an American professional basketball coach and retired player. He is currently head men’s coach at the University of Arkansas at Little Rock. At 6'4" and 180 lb (82 kg), he played as a guard. He attended Chicago's Corliss High School. Vincent Lamar Carter is an American professional basketball player for the Atlanta Hawks of the National Basketball Association (NBA). He is 6 feet 6 inches (1.98 m) tall and plays both shooting guard and small forward. Carter is one of five players that have played an NBA-record 21 seasons. 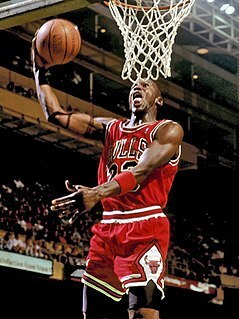 He is widely regarded as the greatest dunker of all time. DeCovan Kadell "Dee" Brown is an American retired professional basketball player who spent twelve seasons (1990–2002) in the National Basketball Association (NBA), playing for the Boston Celtics, Toronto Raptors, and Orlando Magic. Yao Ming is a Chinese basketball executive and retired professional basketball player who played for the Shanghai Sharks of the Chinese Basketball Association (CBA) and the Houston Rockets of the National Basketball Association (NBA). He was selected to start for the Western Conference in the NBA All-Star Game eight times, and was named to the All-NBA Team five times. At the time of his final season, he was the tallest active player in the NBA, at 2.29 m. He is the only player from outside of the United States to lead the NBA in All-Star votes. Dwight David Howard is an American professional basketball player for the Washington Wizards of the National Basketball Association (NBA). Kelvin T. Cato is an American retired professional basketball player. Vakeaton Quamar "Von" Wafer is an American professional basketball player for the Jilin Northeast Tigers of the Chinese Basketball Association. He played college basketball for Florida State. LaMarcus Nurae Aldridge is an American professional basketball player for the San Antonio Spurs of the National Basketball Association (NBA). The power forward played college basketball for two seasons with the Texas Longhorns. Aldridge was selected second overall in the 2006 NBA draft. After spending nine seasons with the Portland Trail Blazers, he signed with the Spurs in 2015. He has been selected to five All-NBA teams and is a seven-time NBA All-Star. He is widely known for his signature fadeaway jump shot. Carl Christopher Landry is an American professional basketball player for the Hiroshima Dragonflies of the B.League. The 6'9", all-conference power forward played college basketball for the Purdue Boilermakers from 2004 to 2007. He is the older brother of Shenita Landry and Marcus Landry. Ryan James Anderson is an American professional basketball player for the Miami Heat of the National Basketball Association (NBA). Jordan Craig Hill is a former professional basketball player. The 2001–02 NBA season was the 13th season for the Orlando Magic in the National Basketball Association. During the offseason, the Magic signed free agent All-Star center Patrick Ewing to their roster, while re-signing Horace Grant to further strengthen the team's depth. Early into the season, they traded Bo Outlaw to the Phoenix Suns for Jud Buechler. 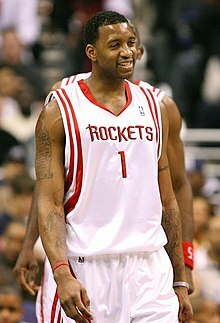 Tracy McGrady continued to emerge as a superstar as he finished fourth in the NBA in scoring with 25.6 points per game, and was selected for the 2002 NBA All-Star Game. However, McGrady would not have much help as Grant Hill's comeback was ended after just 14 games, as he had to get more surgery on his bad ankle. Despite Hill's injury, the Magic made it to the playoffs with a record of 44–38, third in the Atlantic Division. In the first round of the playoffs, they lost in four games to the Charlotte Hornets. Following the season, Ewing, Buechler and Dee Brown all retired, Troy Hudson signed as a free agent with the Minnesota Timberwolves, and Monty Williams signed with the Philadelphia 76ers. Nikola Vučević is a Montenegrin professional basketball player for the Orlando Magic of the National Basketball Association (NBA). He played college basketball for the University of Southern California before being drafted 16th overall in the 2011 NBA draft by the Philadelphia 76ers. He received his first All-Star selection in 2019. The 2004–05 NBA season was the Rockets' 38th season in the National Basketball Association, and their 34th season in the city of Houston. During the offseason, the Rockets acquired All-Star forward Tracy McGrady and Juwan Howard from the Orlando Magic, acquired All-Star center Dikembe Mutombo from the Chicago Bulls, who acquired him from the New York Knicks, and signed free agent Bob Sura. The Rockets struggled with a 6–11 start to the season, then played around .500 as they traded Jim Jackson to the New Orleans Hornets for David Wesley in late December. The Rockets would later on win eight straight games in February, as McGrady and Yao Ming were both selected to play in the 2005 NBA All-Star Game at Denver. 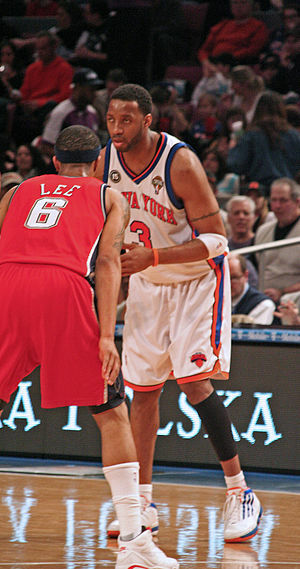 At midseason, the team traded Maurice Taylor to the New York Knicks, and acquired Mike James from the Milwaukee Bucks. Julius Deion Randle is an American professional basketball player for the New Orleans Pelicans of the National Basketball Association (NBA). In his only season of college basketball with the Kentucky Wildcats, he was named a third-team All-American. He was drafted by the Los Angeles Lakers in the first round of the 2014 NBA draft with the seventh overall pick. In his regular-season debut, Randle broke his right leg and missed the remainder of his rookie season. After four years with the Lakers, he signed with the Pelicans. Troy Daniels is an American professional basketball player for the Phoenix Suns of the National Basketball Association (NBA). He played college basketball for Virginia Commonwealth University (VCU), where in 2013, he set the Atlantic 10 Conference record for made three-point field goals in a single game. 1 2 3 4 5 6 7 8 9 10 11 12 13 14 15 16 17 18 19 "Tracy McGrady NBA & ABA Stats". Basketball Reference. Retrieved August 29, 2013. 1 2 3 "Tracy McGrady Biography". JockBio. Retrieved April 30, 2017. ↑ Reyner, Solange. "Tracy McGrady Donates Cash To Upgrade Auburndale High School Gymnasium". The Ledger. Retrieved April 30, 2017. ↑ Stonebrook, Ian. "Tracy McGrady Reflects on adidas ABCD Camp & Playing LeBron on Christmas". Nice Kicks. Retrieved April 30, 2017. ↑ Forsberg, Chris. "Tracy McGrady, humble but proud, highlights Hall of Fame inductees". ESPN. Retrieved September 10, 2017. 1 2 3 4 5 6 7 Golliver, Ben. "Remembering Tracy McGrady's Career". Sports Illustrated. Retrieved August 29, 2013. ↑ "Vince Carter Stats". Basketball Reference. Retrieved April 15, 2017. 1 2 3 Golliver, Ben. "Remembering Tracy McGrady's Career (Page 2)". Sports Illustrated: The Point Forward. Archived from the original on August 29, 2013. Retrieved August 29, 2013. 1 2 3 4 5 Simmons, Bill. "The Unfortunate Tale of T-Mac". Grantland. Retrieved September 22, 2013. ↑ Freeman, Eric. "Tracy McGrady recreates classic All-Star highlight, shows his age". Yahoo! Sports. Retrieved April 15, 2017. ↑ "2002 NBA Playoffs Summary". Basketball Reference. Archived from the original on September 22, 2013. Retrieved September 22, 2013. ↑ "Tim Duncan Wins Second Straight MVP Award". NBA Official Website. Retrieved April 15, 2017. 1 2 "All-Time NBArank 61-70". ESPN. Retrieved April 30, 2017. ↑ "Orlando Magic at Detroit Pistons Box Score, April 20, 2003". Basketball Reference. Retrieved April 16, 2017. ↑ "Francis' meeting with Magic triggers trade". ESPN. Retrieved April 16, 2017. 1 2 "2004-05 Houston Rockets Schedule and Results". Basketball Reference. Retrieved April 16, 2017. 1 2 "McGrady's Big Finish Sends Rockets Past Spurs". NBA.com. December 9, 2004. Retrieved January 28, 2008. ↑ "McGrady Buries Mavericks". NBA Official Website. Retrieved April 16, 2017. ↑ "Mavericks Cruise Past Rockets in Game 7". NBA Official Website. Archived from the original on March 10, 2008. Retrieved April 16, 2017. ↑ Associated Press. "NBA notes: Back injury ends night for McGrady". Deseret News. Retrieved April 27, 2017. ↑ "2006 NBA Playoffs Summary". Basketball Reference. Retrieved April 27, 2017. ↑ "2007 NBA Playoffs Summary". Basketball Reference. Retrieved April 27, 2017. ↑ SLAM Staff. "Tracy McGrady: Bottled Rocket". SLAM Magazine. Retrieved April 27, 2017. ↑ Broussard, Chris. "Tracy McGrady peeled to Heat's run". ESPN. Retrieved April 27, 2017. ↑ "2008 NBA Playoffs Summary". Basketball Reference. Retrieved April 27, 2017. ↑ Associated Press. "McGrady says he's out for the season with knee injury". USA Today. Retrieved April 30, 2017. ↑ Associated Press. "Gasol, Lakers overwhelm Rockets in Game 7". ESPN. Retrieved April 27, 2017. 1 2 Harrel, Patrick. "Wednesday Links: Revisiting The Kevin Martin-Tracy McGrady Trade". The Dream Shake. Retrieved July 19, 2017. ↑ "Tracy McGrady 2009-10 Game Log". Basketball Reference. Retrieved July 19, 2017. ↑ Zimmerna, Kevin (October 9, 2012). "Tracy McGrady signs one-year deal in China". SB Nation. ↑ "Qingdao Double Star Eagles Statistics 2012–13". Basketball.asia-basket.com. Retrieved March 1, 2014. ↑ Austin Ngaruiya (October 8, 2015). "A Brief Explanation Why Tracy McGrady Got His Number Retired In China". Uproxx.com. Retrieved March 5, 2018. ↑ Adande, J.A. "New role, new heights for T-Mac". ESPN. Retrieved April 15, 2017. ↑ "2003 USA Basketball Men's Senior National Team". NBA Official Website. Retrieved April 29, 2017. ↑ "Men's Tournament of the Americas – 2003". USA Basketball. Archived from the original on May 4, 2013. Retrieved April 28, 2013. ↑ "Tracy McGrady Stats, Bio". ESPN. Retrieved April 30, 2017. 1 2 "That Was Then ... This Is Now: Iceman and T-Mac". NBA.com. January 27, 2003. Retrieved January 28, 2008. ↑ Pierce, Paul. "The Five Toughest Players I've Ever Guarded". The Players Tribune. Retrieved April 30, 2017. 1 2 ESPN.com. "Is Tracy McGrady a Hall of Famer?". ESPN. Retrieved April 30, 2017. 1 2 Lowe, Zach. "T-Mac was the original YouTube basketball superstar". ESPN. Retrieved September 10, 2017. ↑ Howard-Cooper, Scott. "Criticized for not winning enough, Tracy McGrady vindicated by Hall of Fame selection". NBA Official Website. Retrieved April 30, 2017. ↑ "Bill Simmons Hall of Fame Pyramid". Basketball Reference. Retrieved April 30, 2017. ↑ "SLAM 500 Greatest NBA Players of All Time". Basketball Reference. Retrieved April 30, 2017. ↑ Golliver, Ben. "Top 20 NBA players of last 20 years". Sports Illustrated. Retrieved April 30, 2017. ↑ Ruger, Todd. "Mom awarded $54,000 a year in paternity case". Herald-Tribune. Retrieved April 30, 2017. ↑ "Chance McGrady Bio". University of Memphis Athletics. Retrieved April 30, 2017. ↑ Gandu, Gurvinder Singh. "A History of Tracy McGrady in the adidas T-MAC". Complex. Retrieved April 30, 2017. ↑ "Tracy McGrady - NBA Analyst". ESPN MediaZone. Retrieved April 30, 2017. 1 2 Feigen, Jonathan (October 1, 2007). "McGrady says he'll spread word about Darfur". Houston Chronicle. Retrieved March 8, 2011. 1 2 Feigen, Jonathan (March 1, 2007). "T-Mac has issues with New Orleans as All-Star site". Houston Chronicle. Retrieved March 8, 2011. ↑ "当前位置：CBA数据中心" [Current position: CBA Data Center] (in Chinese). Cbadata.sports.sohu.com. Retrieved March 1, 2014. ↑ "Tracy McGrady, Bill Self, Rebecca Lobo and Muffet McGraw Headline Class". Naismith Memorial Basketball Hall of Fame Official Website. Retrieved April 29, 2017. ↑ "Men's Tournament of the Americas -- 2003". USA Basketball Official Website. Retrieved April 29, 2017. ↑ Flores, Ronnie. "Mr. Basketball USA Tracker week 8". ESPN. Retrieved April 30, 2017. ↑ "T-Mac Tees Off for 62 Points in Magic Win". NBA Official Website. Retrieved April 29, 2017. 1 2 3 4 5 "Orlando Magic Season Leaders". Basketball Reference. Retrieved April 29, 2017. 1 2 "Orlanda Magic Career Leaders". Basketball Reference. Retrieved April 29, 2017. Wikimedia Commons has media related to Tracy McGrady . Feschuk, Dave (September 13, 2013). "Tracy McGrady wishes he had stayed in Toronto: Feschuk". Toronto Star . Retrieved September 14, 2013.